most directly related to causes begins at the one minute mark. Let's take a quick look at the brain to lay some groundwork for understanding what we know so far about what causes dyslexia. 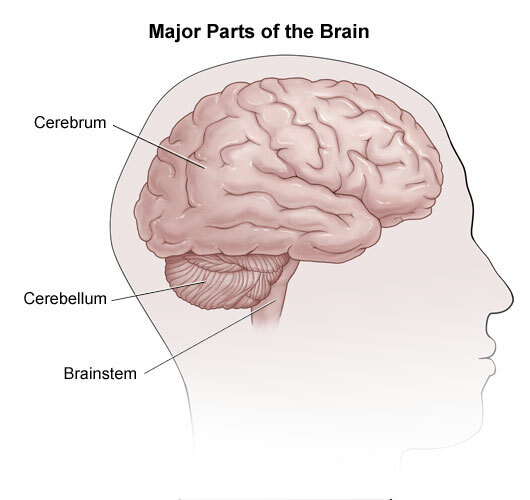 There are three main parts of the brain: The cerebrum, the cerebellum and the brainstem. Note that the owner of this brain is facing left, opposite of the other images. The big wrinkled part of the brain which is divided into the left and right hemisphere. Each hemisphere is further divided into four lobes, based on the obvious groves or fissures that can be seen. 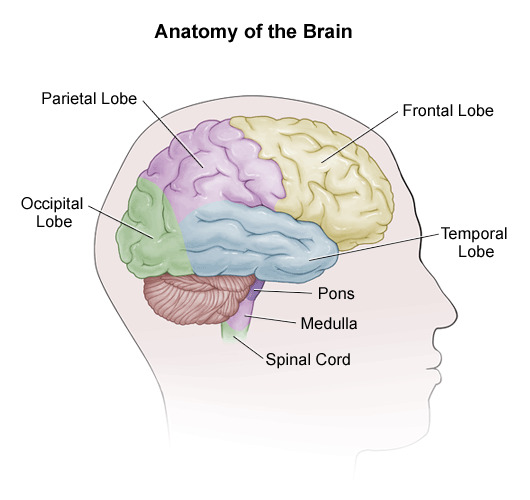 The four lobes are: occipital toward the back of the head, frontal near the forehead and the parietal and temporal in between. The left hemisphere is particularly important for reading and features two small areas directly linked to language: Broca's area on the frontal lobe and Wernicke's area on the back portion of the temporal lobe (near the occipital lobe). See the images above. This smaller area which connects to the spinal cord, controls movement of the eyes and mouth, routing sensory messages (hot, cold, pain, bright, loud), breathing, hunger, consciousness, cardiac function, body temperature, and involuntary movements like, coughing and sneezing. This area is not implicated in reading, but you need to breath if you're going to read. The latest science reveals that the dyslexic brain processes written words differently. 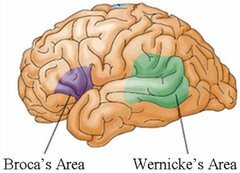 They are relying more on Brocca's areas in the left frontal lobe of the cerebrum whereas strong readers rely more on areas toward the back of the brain, sometimes called the 'wordform' area between the Occipital and Temporal lobes (close to, but not exactly at, Wernicke's area). For efficient, non-dyslexic readers, this area at the back left of the brain is very active during fluent reading; words are being recognized here at lightning speed! It's almost like a Read Only Memory databank of words you know by heart. Those with dyslexia aren't tapping this high powered area; instead they are compensating by using more real estate in the front of the cerebrum, which isn't as effective. Over time dyslexics tap portions of the right hemisphere to supplement their reading skills. 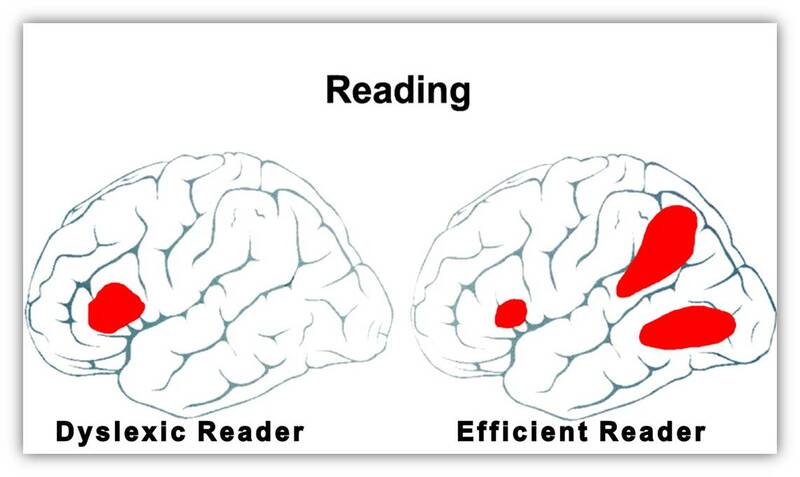 However, these areas are not as efficient for reading, so they end up as slow but accurate readers using a lot more brain effort for less results. In terms of causes of dyslexia, this inefficient pattern of brain activity is right at the top of the list. Attention Deficit Hyperactive Disorder (ADHD) is a condition that often occurs together with dyslexia, and similar regions of the brain are implicated in both, suggesting some underlying similarities. Nonetheless, they are distinct conditions. Knowing that dyslexics use different portions of their brains to read is interesting, but it doesn’t really explain why those sections of the brain are less efficient at reading. The truth is that scientists don’t know exactly what distinguishes the processing going on in Wernicke’s area vs Broca’s area vs other areas. Nor do they know why persons with dyslexia are using different parts of their brain to accomplish the same function to begin with. Further, many areas of the brain are implicated in reading, making the interaction among them extremely complex to untangle. While we don’t know what the ultimate cause of dyslexia is, we do know something about the "intermediate" cause. Brain regions dyslexics are using to read are not very good at processing phonemes—the basic sounds of language. The individual sounds become "sticky", unable to be broken apart and manipulated easily. This is known as the phonological processing impairment theory. Can you change a brain that tends to fire differently or will it always remain the same? The exciting answer is that a lot of change is possible. Dr. Sally Shaywitz and a team from the Yale Center for Dyslexia and Creativity studied the brain activation patterns of children who were struggling to read but then received a yearlong experimental reading program. "the final set of images obtained one year after the intervention had ended was startling. Not only were the right-side auxiliary pathways less prominent, but more important, there was further development of the primary neural pathways on the left side of the brain....we had observed brain repair!" pp. 85-86 in Shaywitz,Sally. Overcoming Dyslexia. Vintage Books. 2003. A good reading program can help rewire the brain to read better - that's exciting to know! Some of the improvement the Yale University team found may have been developmental (they grew into it) but the research evidence is continuing to show that good reading systems actually lay down new and better firing patterns - and the earlier this intervention is done, the better the results. At the same time, the brain is also being revealed to have greater 'plasticity' than previously believed, giving hope for improvement at all ages! What about genetics? Since dyslexia is hereditary, can’t we find the genes involved and could ‘gene therapy’ then give us some control over dyslexia’s effects? According to the UK’s Dyslexia Research Trust, a non-profit organization that supports research into learning disabilities, chromosomes number 6 and 18 have been implicated in dyslexia. For example, they looked at 50 genetic markers within 15 brain-expressed genes located on chromosome 6, finding strong associations between one particular gene, named KIAA0319, and low performance in tests for reading, spelling, orthography and phonology. Similar results have been found in independent studies. Still, finding the exact genes involved and understanding precisely how they are activated and expressed (or inhibited) is extremely difficult. Don't expect any genetic fix in the near future. Is there any evidence that environmental causes could be behind dyslexia? Things like drugs or alcohol taken during pregnancy or something found in the toddlers environment? Or how about something absent from the environment such as vitamins and minerals? Could these be root causes that precede all the trouble with processing in the brain? The short answer is no—there is little to no evidence pointing to environmental causes of dyslexia, such as drinking during pregnancy, contact with heavy metals etc. Children raised in impoverished reading environments can present as dyslexic, but respond very quickly to intervention, as long as they are caught at a relatively young age. Acquired forms of dyslexia (trauma, stroke) could be considered environmental in origin, but are really a different reading problem altogether. See our page on types of dyslexia for more information. Dyslexia, in its most common form, is a very intractable reading problem caused by a genetic, hereditary difference in the way the brain processes language. Recent advances in brain scanning technology have confirmed this neurological signature. And while there is no silver bullet gene therapy around the corner, we can now assess reading interventions based (in part) on how they alter firing patterns in the brain. Perhaps most importantly, we've learned that dyslexia is not caused by low intelligence, lack of motivation, laziness or bad parenting. Dyslexic readers simply need effective reading interventions, simple accommodations, encouragement and praise.